I have compiled some cool moon jellyfish facts for kids and also for grownups. I hope that it will help both the students and general inquisitive readers alike. I have tried to include everything you need to know about moon jellies. The creature is called “Moon Jellyfish” due to its perfect full moon like appearance and the semi- transparent body which gives it a white and glorious look in the water. Actually there are 13 species of moon jellyfish. All of these look strikingly similar. It is very difficult to identify the species of a sample without DNA synthesis. Most common of them is the species Aurelia aurita. Moon Jellyfish belongs to the class Scyphozoa. In fact, every “true jellyfish” belongs to this class. The phylum of the class is Cnidaria. Sea anemones, corals, sea pens etc also are cnidarians. Look at the chart below to understand the classification better. The size of a moon jellyfish can be measured by the radius of the disc of the medusa. It can be quiet large, 25 to 40 cm in diameter ( 10 to 16 in). The size of the medusa is very small. The larvae is so small that it can’t be seen in bare eyes. Moon Jellyfish normally lives in temperate water. But they can survive in low temperature regions of the oceans without much problem. Best temperature for them is 48 to 66 F (9 – 19 C). Despite being salt water creatures, moon jellies can live in the brackish waters of estuaries and bays. They can also withstand very high salinity. You can found them near the coast of almost every ocean and sea of the world. But there population is greater near the North American and European shores where water temperature remains temperate throughout the year. The adult stage of a Moon Jellyfish is its medusa stage. The larva that comes from a fertilized egg is known as a planula. It is microscopic in size and has cilia to move around. There is a yolk attached to its body as a long term food source. The larva can’t collect its own food. When the food stock of the yolk is finished, the larva attaches itself with a hard substance. It may be a shell of a sea animal, a rock or even the underbelly of a boat or ship. After that it becomes a polyp. The polyp is looked like a sea anemone. One interesting facts about these polyps is that they can multiply by separating buds from their own body. In this way, one polyp clones itself to create many genetically identical copies. After sometime, a colony has been formed by the process. The polyps feed themselves by using tentacles. 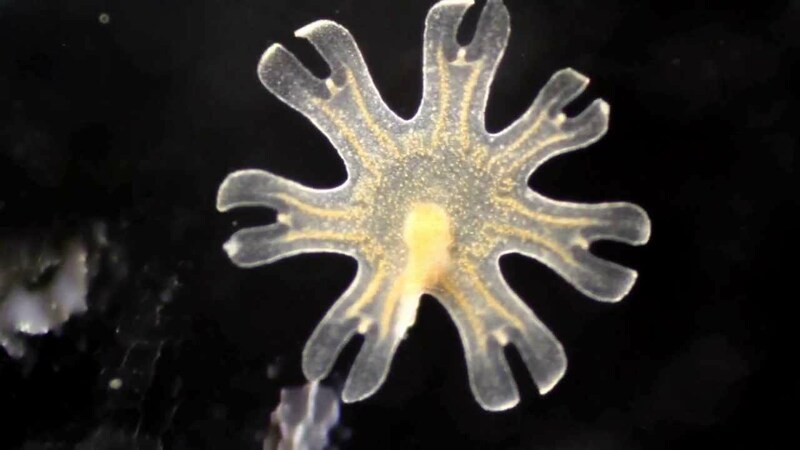 After a few months a polyp lost its tentacles and become a strobila. 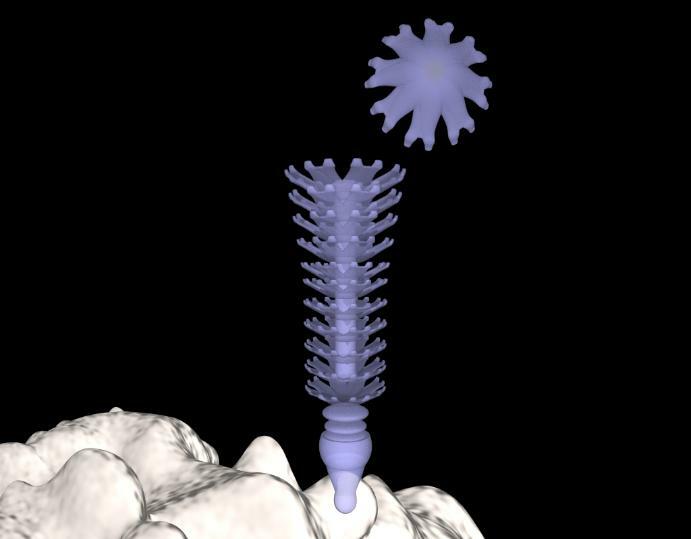 After that, a part of the strobila is detached from it and becomes a free floating ephyra. The ephyra is small and has its own tentacles. It becomes a small medusa very soon. After that, the small medusa grows to become a full sized Moon Jellyfish. A full sized moon jellyfish has clearly visible gonads. These organs produce sperm and ovum. The males release the sperm cells in the water. The females also release the egg cells into the water. The fertilization process takes place in the water too. The fertilized eggs undergo many cell divisions. At last, an egg grows into a tiny planula. We have discussed earlier the later stages of development of a planula. The polyps can produce asexually. Like the branch of a tree, a polyp can grow another polyp. That process is known as budding. In a similar process, one strobila also divides itself into many ephyra. Do you know how long moon jellyfish live? 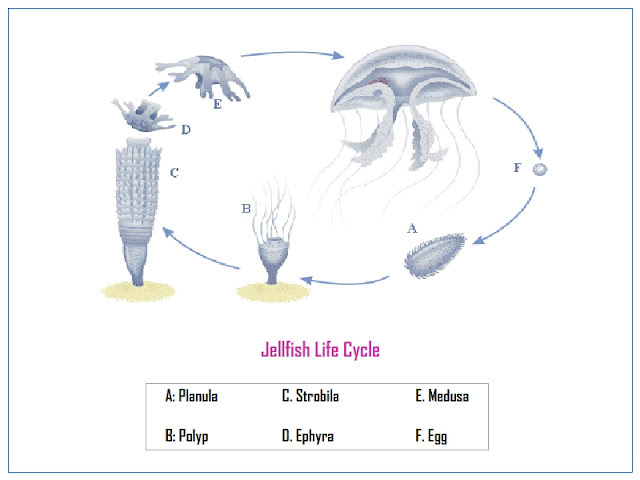 We know that the life cycle of the creature is very complex. It undergoes many stages and forms. There lifespan is about one year in the oceans. The summer is the time of mating and production of eggs. The planula or larva stage only lasts for 7 to 10 days. In the medusa stage, the jellies spent the time from summer to winter. Spring is the time of production of ephyra from polyps. The ephyra soon grows into a medusa. The medusa dies after the summer mating process. So, we can see the full grown adult moon jellies or the medusa form of it does not survive for long. There are many different forms and shapes of a moon jelly during its life cycle. Here we are going to discuss about the anatomy of the medusa stage. The medusa has a circular disc. It is semi-transparent. There are four horse shoe shaped gonads visible from outside. The disc is known as the bell. The bell is mainly made of mesogloea, a jelly like substance. Mesoglea is contained by two covers – the outer epidermis and the inner gastrodermis. The structure of the animal is supported by a hydrostatic skeleton. There are small tentacles attached to the rim of the bell. 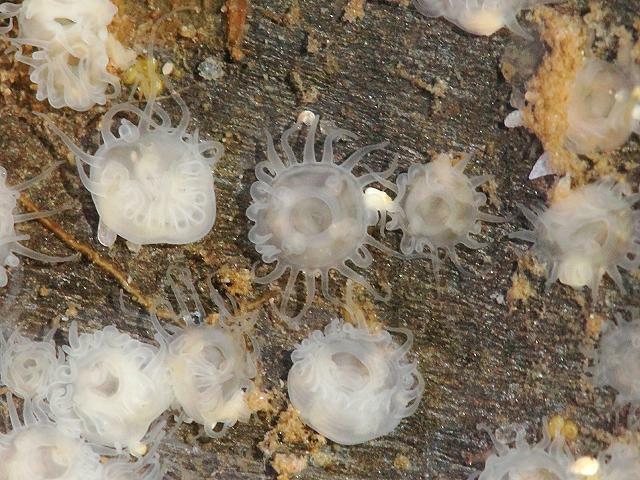 These tentacles have stinging cells to paralyze prey. The venom of this jellyfish is not very strong. There is a central cavity in the under surface of the bell. It is the mouth of the animal. There are some oral arms hanging from the central cavity. These arms help to bring food to the mouth. 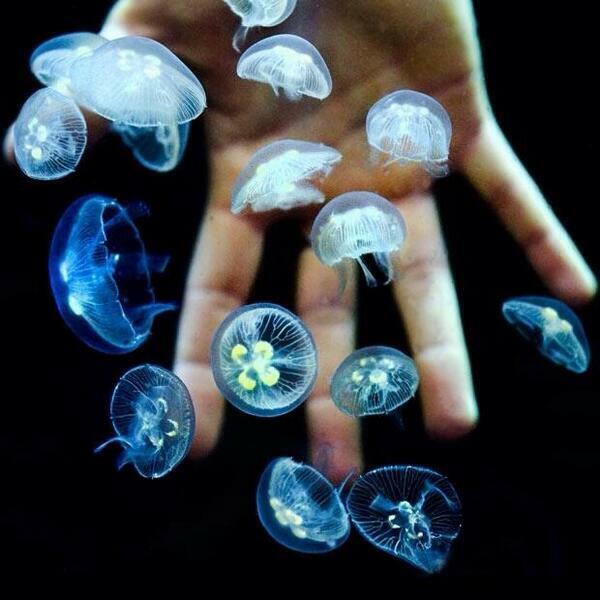 The moon jellies do not have a brain. There are some independent nerve cells and network though. It helps the creature to understand its environment. It also does not have true eyes. There are eye spots or ocelli which helps it to recognize light intensity and direction. They have a stomach. It is divided into gastric pouches. There is no other digestive system. There is not even any intestine. How do Moon Jellyfish Move? 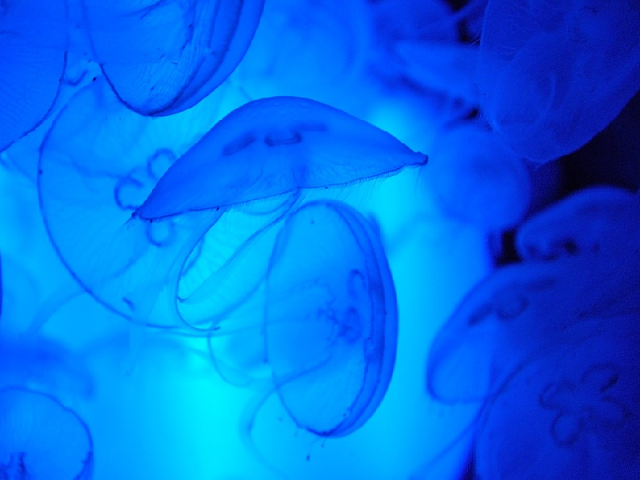 The moon jellies use jet propulsion system to move in the water. 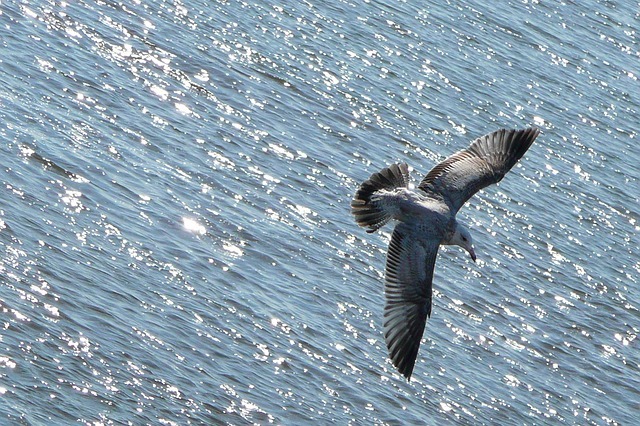 By contracting its disc like bell, the creature creates a high speed jet of water. That stream propels it forward by means of reaction according to Newton’s third law. That system of locomotion is surprisingly efficient. There oral arms and tentacles do not help them to move. But their main way of locomotion is ocean current. They are plankton like creatures and so drifts with ocean current. In this way they can move thousands of miles. 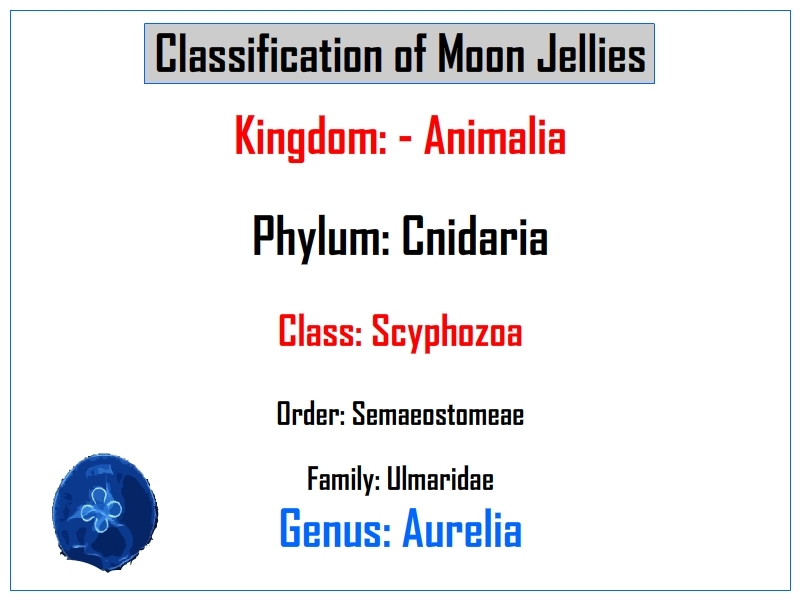 What do Moon Jellyfish Eat ? Moon Jellyfish diet comprises small crustaceans, fish eggs, tunicate larvae, and many other plaktonic creatures. That carnivore eats small sea worms, copepods and eggs of various small sea creatures. The food is caught by the tentacles. The floating small sea creature gets caught by the mucus of the tentacles. The stinging cells make it paralyzed. After that, the food item is slowly brought to the oral arms. Those arms push the item into the oral cavity. 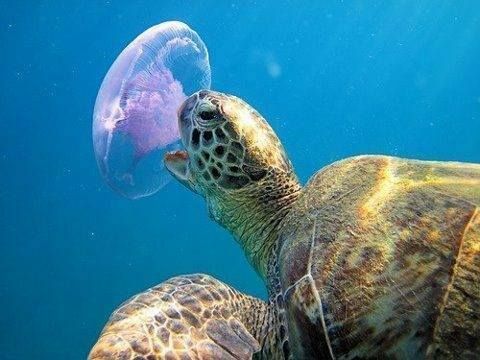 Some turtles are the most well known moon jellyfish predators. Leatherback turtles are particularly fond of jellyfishes. Other such turtles are Olive Ridley, Kemp’s Ridley, Flatback etc. The tough skin of a sea turtle is enough to save them from the stings. The heavy fish Ocean Sunfish also often eats them. 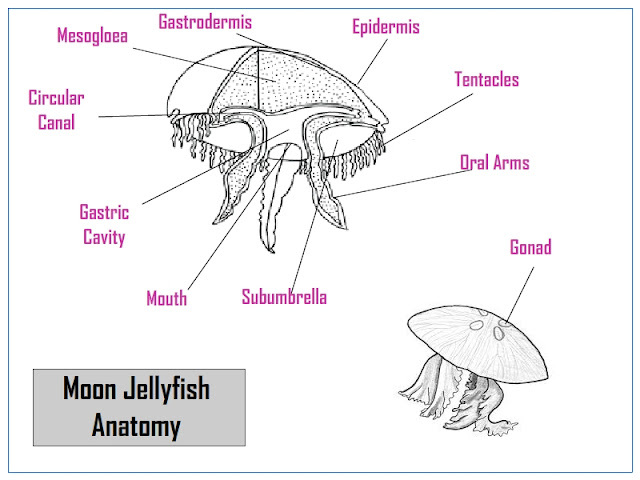 Other moon jelly predators are Spiny Dogfish, Bearded Goby, Atlantic Bluefin Tuna, Butterfish, Swordfish etc. Moon jellies have many adaptations to make themselves fit for the environment where they live. They use jet propulsion to move around which needs very little energy. As their energy requirement is low they can survive with lesser foods. They can also adapt in both hot and cold waters. They can also live in less saline environments. They have no brains or respiratory system. Yet they can survive in the wild without much problems. Their eyes are primitive but enough for their needs. Do Moon Jellyfish Sting? Yes, they do like any other cnidarians. There are tentacles are full with small stinging cells which helps them to paralyze prey. Is moon jellyfish poisonous? The answer can be both yes and no. Yes, there stings have venom. But it is too mild for humans to do any real harm. The stinging can only create itching, nothing more. In most cases, the sting of the jelly cannot break the skin. Do you want to share some cool moon jellyfish facts to us? If yes, you can do it easily via the comment section of this blog. We are all ear to hear your suggestions about anything else.